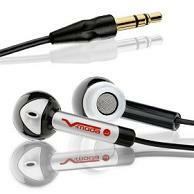 New lightning sale on a pair of V-Moda Bass Freq Earbuds. List price of 29$, previous discount of 22$, but this deal has them at 14.95$! The sound given off from these headphones is similar to that of the more expensive brands, but at a fraction of the price. Only difference being these are made of plastic instead of metal, though they are still durable.